A candlelight ceremony for pet loss can be comforting. A candlelight ceremony for pet loss serves as a memorial service to remember a cherished pet that has passed away. These ceremonies can be comforting for pet owners, who struggle with the grief associated with the death of their companion animals. Even years after pets have gone, there can still be lingering pain and sadness when remembering them. The death of a family pet can be just as devastating to some as the passing of family members or friends. This is because, to many, a pet is a true family member, afforded all the love and care taking as any other. Pets are a large part of many people's lives, and their deaths are deeply mourned. Companion animals, just like people, sometimes pass away quite suddenly, leaving their owners surprised and saddened. Even when a pet death comes after a lengthy illness, it's still a sad occasion. There is also grief and feelings of guilt associated with the decision to have a pet euthanized, where owners second guess themselves and wonder if there wasn't a better alternative. A candlelight ceremony or candlelight vigil can bring some comfort to grieving pet owners, calling attention to their loss and giving them a time and place to deal with their sadness. These ceremonies can be done privately, with friends and family members, or with a group of others who are going through the same situation. The best part of a candlelight ceremony is that the only necessities are candles. Candles are thought to provide light for the departed, and their warm glow helps to relieve stress and anxiety for participants. They can also set the mood of the ceremony, allowing time for quiet reflection. Special pet memory candles can add a personalized touch. Any type of candle can be used, from votives in glass holders to handheld tapers, or a group of pillar candles. 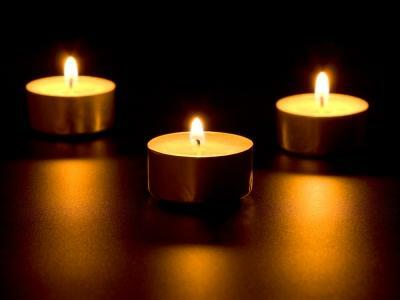 Create memory candles for each pet being remembered, and have the owners light their pet's candle. Let each guest speak for a few minutes about his or her pet, sharing personal stories and feelings. For a ceremony where only one pet is the focus, create a memory table with favorite toys or other items, along with a candle and framed photograph. Prayers, poems, and other prose can be recited, or hymns sung. Once the candles have been lit, they can be left to burn for a while. Some pet owners prefer to have the candles snuffed out, and then distributed to those who lit them. In this manner, participants can take their candles home and light them in private, allowing for personal reflection and private grief. Many communities have pet loss support groups, and candlelight ceremonies for pet loss can be a regular event within these groups. Check with your local animal shelter or veterinarian to see if these are available near you. If not, you could consider setting something like this up yourself.These community events usually include speeches about the grieving process, along with prayer or spiritual readings. This is followed by a candle lighting ceremony, in which each person in attendance lights a candle to remember their cherished pets. Online communities have gathered together to share their grief over the deaths of their pets. One such community, found at Monday Candle Ceremony, has a tradition in which members light a candle each and every Monday night to remember lost pets. This is done around the world, at 10pm Eastern time. The community gathers in a chat room to support one another, but this is entirely optional. One for "acknowledgment and peace"
It is not required that you follow along with the ceremony, as the simple act of lighting the candles, while knowing that others across the globe are participating in the same ritual, can be very comforting. It can be devastating to lose a pet, and it often seems that others don't understand the depth of grief that can result. A candlelight ceremony can give pet owners the recognition they need in order to work through their grief.